What Should You Do if You Can’t Feel Your Baby Kick? Image: Thomas Barwick/Getty Images. Design: Ashley Britton/SheKnows. One of the most exciting parts of pregnancy — feeling your baby kick — also has the potential to be the most nerve-wracking. It's completely natural to feel concerned if you haven't felt your unborn baby move for a while. But what should you do about it? The first thing to remember is that every mom — and therefore every pregnancy — is different. While some moms might feel slight "quickening" movements as early as 14 to 16 weeks, others don't feel movement until later in pregnancy. So basically, what's normal for another mom might not be normal for you. According to Ashlyn Biedebach, women’s health RN and doula, how early you feel baby movement varies based on whether it's your first pregnancy (typically, you feel movement earlier if it's not your first pregnancy), how many babies you are carrying, the placement of the placenta — feelings of movement can be impeded if the placenta is anterior (attached to the front of the uterus) — and your body composition. Why is baby movement important? "The movement of your baby reflects the health and well-being of the placenta," Dr. Sherry Ross, OB-GYN and women’s health expert at Providence Saint John’s Health Center in Santa Monica, California, tells SheKnows. "The placenta is the 'heart' of the pregnancy since this is where all the nutrients and oxygen come from, which go directly to your baby. If there is less baby movement, this could mean the placenta is no longer working well and could ultimately be dangerous to your baby." When should I feel my baby kick? When you start feeling regular fetal movements — whether that's at 18 weeks, 21 weeks or 24 weeks — you may be able to identify your baby's unique patterns. "Your baby sleeps most of the day while growing inside your uterus," says Ross. "After meals, snacks and at night, your baby's movements will be more noticeable." According to Ross, you don't need to get too worried about counting your baby's kicks unless you notice your baby’s daily movement is less often in general. As long as your baby has 10 movements in a two-hour period at least twice a day, you don't have anything to worry about, she says. Biedebach recommends setting aside a time during the day to sit down, rest and focus fully on fetal movements, making notes on paper or your phone to establish a baseline. "Moms can usually tell if something is happening that is different than normal, especially as the weeks go on and Baby is bigger," she says. "At this point, it isn't as hard to monitor movement since your baby's movements get more noticeable." However, it's normal for your baby's movement to change and be less noticeable toward the end of your pregnancy. "As your baby grows — a half pound a week in the last trimester — she has less space to stretch out," explains Ross. "The most likely reason a baby stops moving as much is due to less room inside the uterus. The baby grows faster than the uterus near the end of the pregnancy. It makes sense that a bigger baby has less space in the uterus to move as energetically as you may have noticed earlier in your pregnancy." What should I do about decreased fetal movement? If you notice less movement during the day, Ross suggests drinking a large glass of juice or a high-sugar drink and lying on your left side in a comfortable and quiet location. "There is a good chance the baby will move with a sugar and hydration boost," she says. "I recommend waiting two hours to see if your baby’s movement becomes noticeable." If your baby still doesn’t move within that two-hour period, Ross recommends contacting your health care provider or obstetrician. "You may get an ultrasound to make sure the amniotic fluid around the baby is normal and the baby’s muscle tone and reflexes are present," she says. "Your doctor may also put you on a heart monitor to carry out the ultimate test for your baby’s well-being." 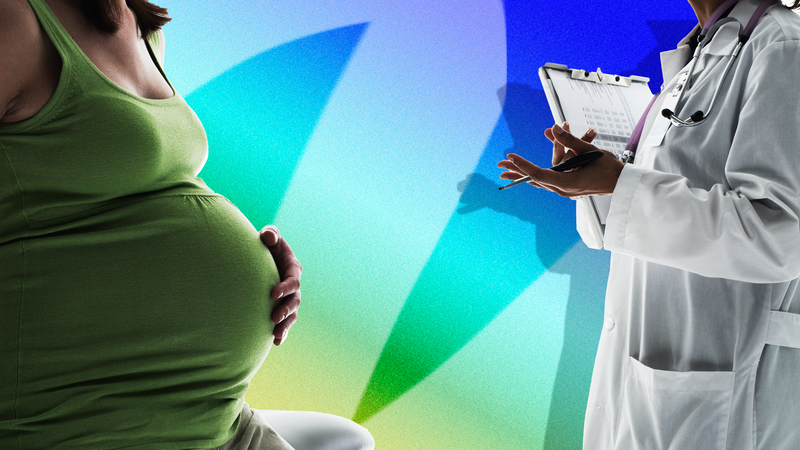 More: Is It OK to Use Marijuana During Pregnancy? As with everything pregnancy-related, the most important piece of advice is to follow your gut feeling. If you're concerned about a change in your baby's movements, don't hesitate to contact your doctor. When it comes to your baby's well-being — and your peace of mind — it's always better to be safe than sorry.